Slowly but surely getting to where it ought to be. One to keep an eye on. I agree with vamoosh entirely, i couldnt believe my eyes when i popped in after finding out it was open again, utterly awful, and more expensive than most of the town centre! since re opening this classic pub and re naming it the jekil and hyde it is indeed hidious! sky high prices, poor food and an even worse choice in interior/ exterior decor ! After being a regular user for over 25 years i have never seen the place so empty ! Dont just take my word for it..... but im voting with my feet along with all the other regulars,...... were going into hyde..ing ! 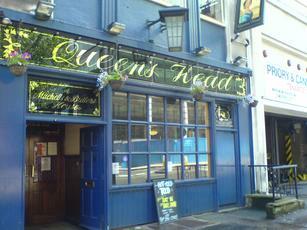 I've been drinking in The Queens (or the QH as some might call it) for over 20 years now. I love the fact that it has a great mix of clientele including Solicitors, journalists, buiders, sales people nad a whole host of other characters. If you find time to eat, the food is well prepared, prompt, delicious and very reasonably priced ! I have some fond memories and aim to have many, many more. Karaoke nights, Disco's, Quizzes and a FREE golf machine make for some terrific banter. I thoroughly recommend a visit soon. The staff and management have a great humour.